I’ve never imagined I would post a Pakistani recipe on my blog, but here it is. Living in overseas as an expat offers me many wonderful cultural experiences. I live in Malaysia; one of the beautiful SE Asian countries where so many cultures intertwine. My family got to know a Pakistani family here and learned a lot about their culture and “the Food”. 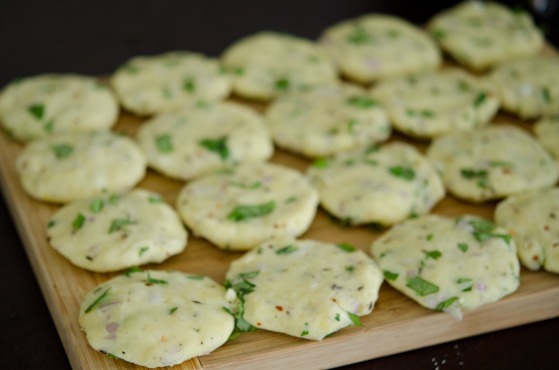 Fouzia, a Pakistani mother of three young handsome boys and an amazing cook, showed me how to make chicken biryani, butter chicken, chapati, and this simple and delicious Pakisatni Potato Cakes. Her biryani was especially delicious but it was quite of work if you make from scratch. She also taught me how to make chapati. Chapati is quite fun to make (mine never came out as round as hers). It is so hearty and healthy compare to Naan. Now I prefer eating my curries with chapati. 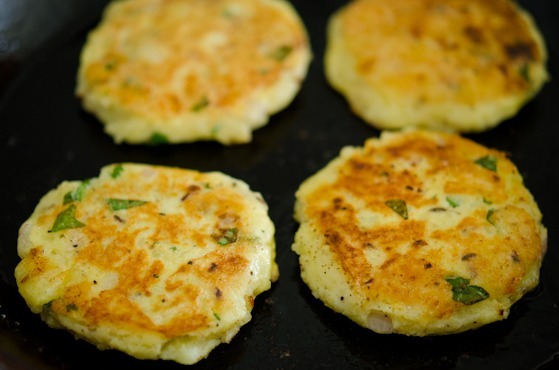 My first attempt to imitate the authentic Pakistani food is these potato cakes. They are truly one of the best potato cakes I’ve eaten. The gentle spicy kick with cumin seeds, chili, and coriander.., they provide lovely fragrance and the deliciousness in your mouth. They are gluten free, partially vegetarian (need to use eggs) and yum-yum to anyone’s stomach. Not to mention how easy it is to make, of course. I like to toast them to bring out their wonderful fragrance even more. Boil the potatoes until fork tender. I used Yukon potatoes. Remove their skins and mash them. 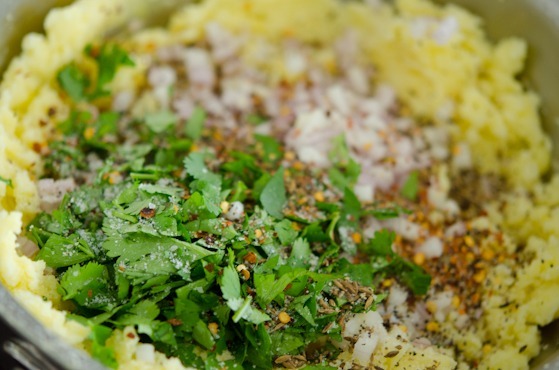 Add cumin seeds, minced shallots, chili flakes, and chopped coriander (cilantro), salt and pepper to taste. 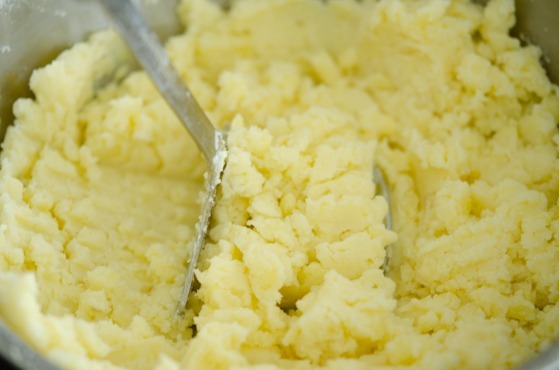 Form into patties, about 2 1/2″ in size. Coat them with beaten eggs. 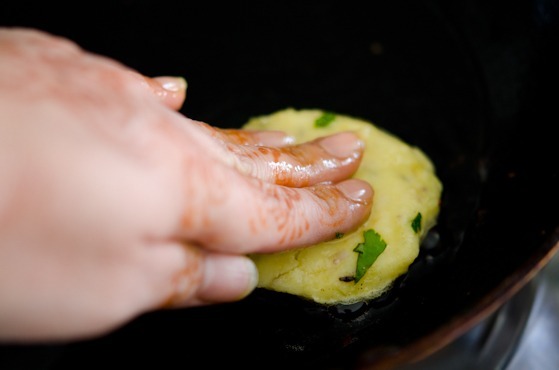 Heat a little oil in a skillet and add the patties, pressing them down gently. These past few days, my thoughts and prayers are with the victims and their families of Boston Marathon explosion. I got teared up by reading what happened and all the heroic actions of people at the scene. The world is getting harsher, and tragic events are happening everywhere around the us. But with the humanity we cherish and the noble actions from the caring people…, I think that makes this troubled world much better place to live. 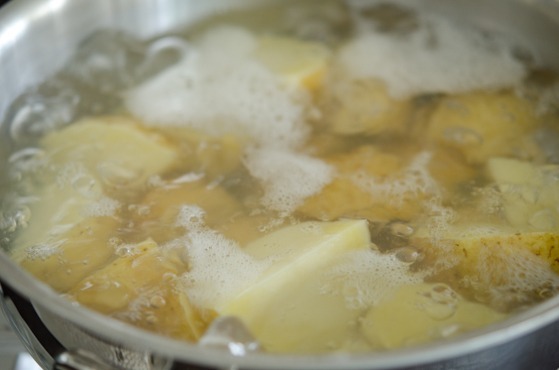 Boil potatoes in the water until soft. Drain and set aside. 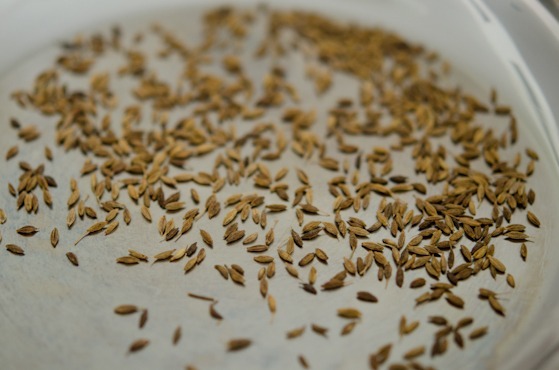 In a small skillet, toast the cumin seeds until fragrant and lightly browned. 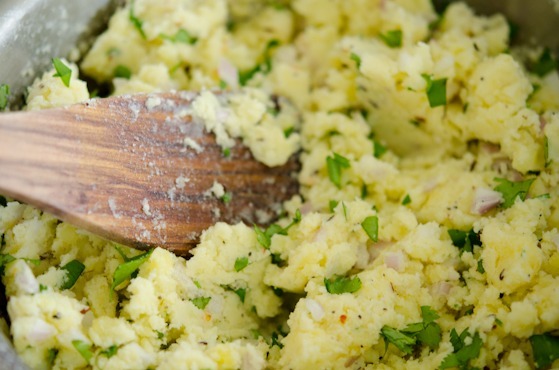 Mash potatoes in a large mixing bowl, add cumin seeds, shallots, cilantro, chili flakes, pepper and salt. Mix well with a spoon. 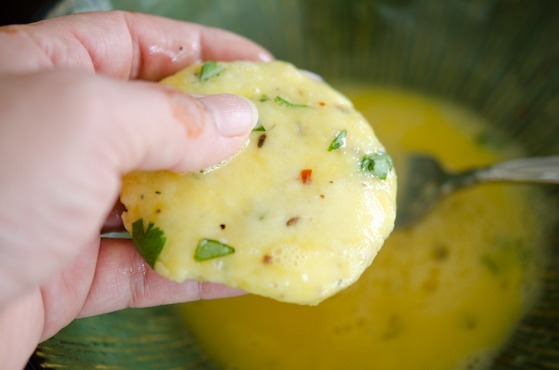 Form the potato mixture into patties, about 2-1/2" in size. Heat oil in a skillet over medium low heat. 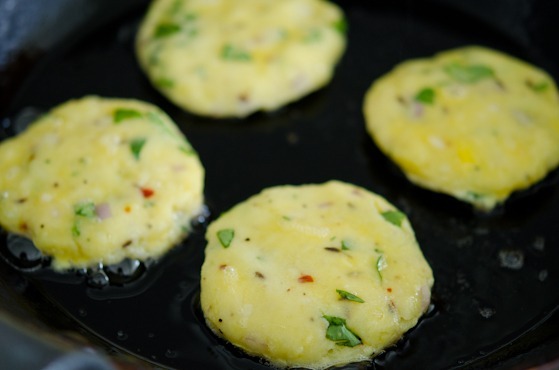 Coat the potato cakes with beaten eggs and place on a heated skillet pressing down gently. Fry them until golden brown on the outside, about 3 minutes. Turn over and fry the other side. 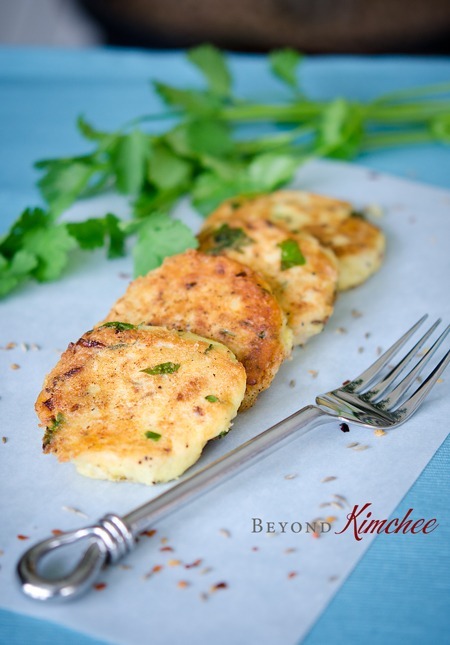 Sounds delicious these potato cakes! I like the combination of spices and cilantro, quite unique isnt it. Will try this soon. I didn't know you are in Malaysia, that's where I'm from! :) Always nice to learn about new cultures and their food. 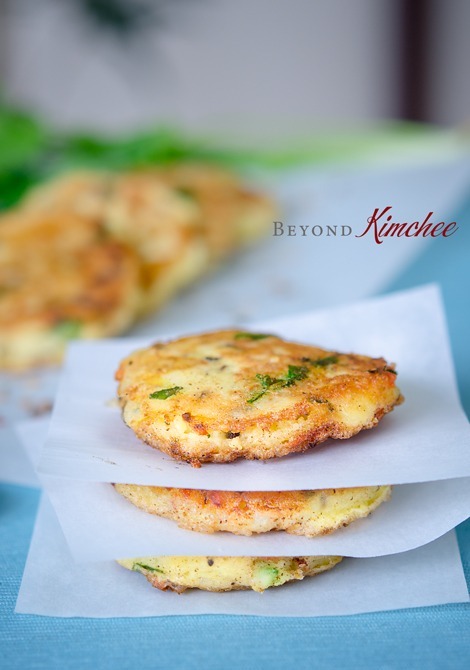 These potato cakes look super delicious. Looks good! I'm looking forward to trying them. These are great! I've made "potato pancakes" out of leftover mashed potatoes that are similar, but spiced quite differently. Really nice recipe (and fun!) - thanks so much. Yes, I am blessed with opportunities to live in different countries. However, everything in life has its pros and cons. Love our life in overseas but often miss our families and friends in the States. The older you get, the deeper rooting instinct kicks in. You made such a delicious savory cakes and your images are very tempting. I love potatoes, and potato cakes but never made it that way. Fantastic Recipe, Holly, thank you for sharing it with us! It looks so tasty! and even better it seems quite quick to make. Never made pakistani dishes before but I think I will give this a try next time when I'm craving for potato dishes. These look so delicious. I'm going to try them very soon! Discovering other cuisines is the best part of living overseas! I loved eating Serbian food in Beijing and learning to cook Indian curries in Paris :) Thanks for a delicious recipe. you're in Malaysia? amazing! I'm Malaysian, By the way, have you tried 'nasi lemak'? Yes, I tried many Malaysian cuisine. My favorite has to be sambal dishes. Curries are great, too. Those potato cakes look delicious! I'm a huge fan of potatoes, so any new way to cook them is always fun. This was so delicious! It tastes very savory, I imagine it must be what street food in south asian tastes like. Thank you for such an amazing and easy recipe! I am so glad that you liked it. There are so many delicious food in SE Asia. Thanks for the comment. 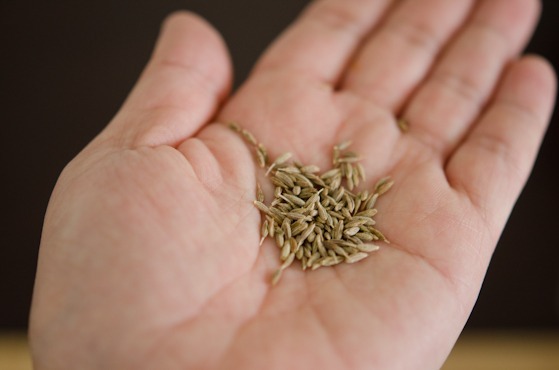 I love cumin and we also use it in some of our recipes in Turkey. I will also add this one in my recipe notebook. After coating them with egg, they could be coated with bread crumbs for the ones who like more crunchy things. 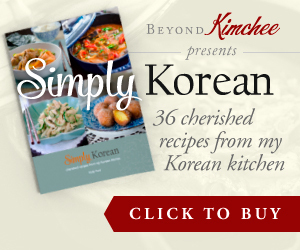 I will also try to cook your Korean recipes and I hope, I will succeed :) thanks for your sharing from Turkey. Made the Pakisani pancakes this evening. Absolutely delicious--2 thumbs up from both my husband and my 9 year old son, definitely the best potato pancakes ever. I also made your naked mandoo yesterday which my son liked but he said he likes the traditional mandoo better. I am very happy to have found your site and your delicious recipes. 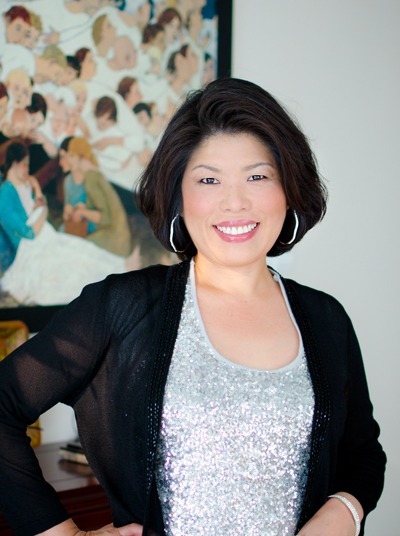 I love to cook, read and try new recipes, especially ethnic dishes.-- My therapy! Your recipes remind me of the delicious cooking my aunt from Pusan does, which is very different from my mom's cooking (from Seoul area). My secret - I like my Pusan aunt's cooking much better...and now I can cook more like that, thanks to you!!! :) My American husband loves duk so I will be trying your LA ride cakes soon. Hopefully you get email notifications, or you'll never see this, but I've been following you for what seems like forever. Before I entered college at least. You hooked me in with your Spicy Korean Fried Chicken, and I never looked back! With these, how well are they supposed to hold together? When I'm done, they're kind of just like baked mashed potatoes, not crispy or crunchyish as I thought they'd be! Any tips with this? Thanks so much- again, I absolutely love your website, never stop! Hi Emily These potato cakes are somewhat delicate to cook. They are not particularly crispy but you can achieve that by using more oil when frying in the pan. I would turn these cakes only once during the cooking time. If you turn them over too often they might get broken easily. Just let them sear in the skillet for a few minutes, then turn over and continue to cook without moving them around. Add more oil if the skillet seems dry. I am sorry to hear that you cake didn't turn out the way you hoped for. It is always frustrating when recipes didn't work out. Hi Azarmeen Surprised? I love Pakistani food and I wish I can find some ingredients here so I can cook more often. Corn and tomato salad sounds so refreshing!